Description: Obsidian highlights a Grand profile featuring a teardrop-shaped Botticino Idalight diffuser which is enhanced with a smooth rugged ring in an Oil Rubbed Bronze finish. Curved panels of stunning Idalight are graced with a decorative finial on the bottom. 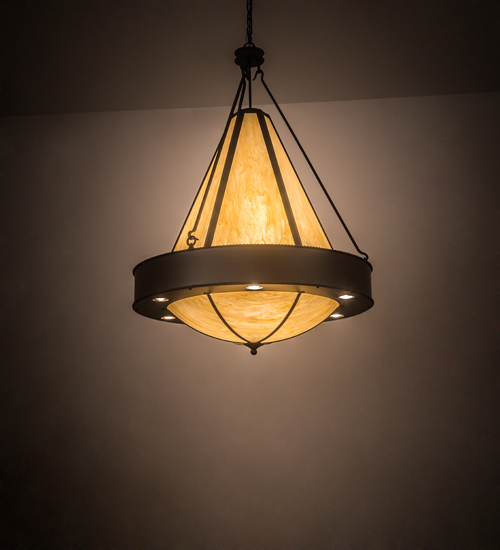 The overall height of this pendant ranges from 55.5 to 90.5 inches as the chain length can be easily adjusted in the field to accommodate your specific lighting application needs. Illuminates with 6 customer-supplied E26 base downlights for task illumination and 6 customers supplied E26 base lamps that bring out the beauty of the Idalight. Handcrafted in our 180,000 square foot manufacturing facility in the USA. Custom options available. UL and cUL listed for damp and dry locations.